Home / Blog / What Do Beetles Eat Around Your Home & Outside? Beetles in your home—what are they and how do they get inside? There are 350,000 known beetle species in the world (with many more to be discovered!). North America is home to over 25,000 species of beetles. The most commonly spotted of these are the Carpet Beetle, June, May, Leaf, and the Lady Beetle (more commonly known as the Lady Bug). Carpet beetles, Wood Boring, Long Horned and the Powderpost Beetles are the types of beetles most frequently encountered by homeowners. Although they differ in size, color, and shape, all beetles can be set apart from other bugs and cockroaches by their hard, shell-like wings. 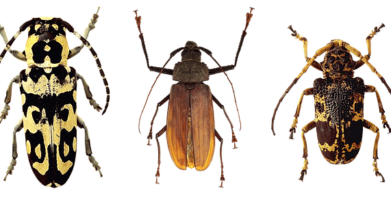 Beetles find their way into your home through opened doors, windows, and cracks. Sometimes these pests enter through beetle-contaminated boxes, carpets, plants, wood and other materials. Maybe you have noticed hundreds of beetles clustering themselves around your door frame in the fall? They are looking for a way inside your home to escape the upcoming weather, lay their eggs, and find food. What exactly falls into the category of beetle food? The beetle’s diet—what do beetles eat? 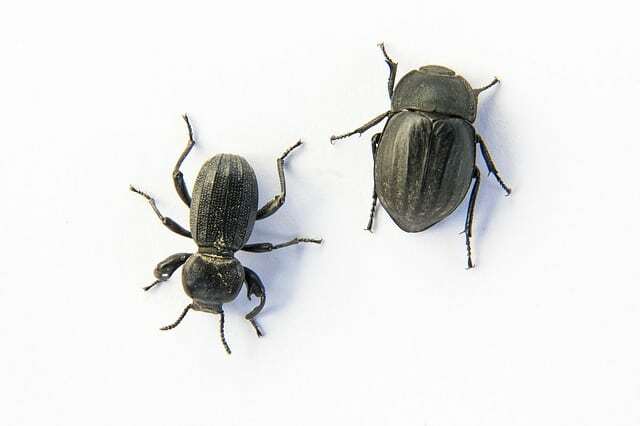 Beetles may enter your home for different reasons, but most often, they are looking for a reliable food source, or shelter due to changing weather conditions. Once inside, beetles will find a dark, cozy and small area to inhabit. One that provides an immediate food source for them. Attics, basements, furniture, tapestries and carpets are a popular choice. Most beetles can be found feeding on plant sources, such as roots, stems, leaves, seeds, fruit and nectar. Others eat animal fibers, feces and funguses. The most damaging beetles, Wood Boring, Long Horned, Powderpost and the Carpet beetle, are those that feed on carpet, wood, and other household materials like clothes, curtains or blankets. You can find Flour and Merchant Grain Beetles in your pantry munching on, and burrowing in dried fruit and grains, nuts, spices and chocolate, even cookies and cake mixes. Adult beetles and larvae are continually snacking on their preferred food source. Some species can survive without food for several weeks. 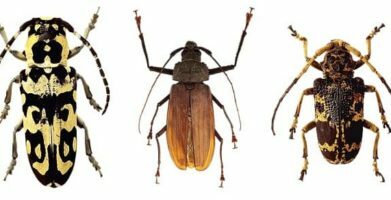 Although beetles have distinct food preferences, they have adapted to eating other things for sustenance when there is a lot of competition or a limited food supply. Sometimes what beetles eat depends on what they can find. Do not leave any attractive foods uncovered that could possibly turn into beetle food. Keep all food that attracts beetles, like flour, grains, fruit and nuts in air tight containers, ensuring that they will not be able to access it. Clean up crumbs and wipe down counters, floors and shelves immediately after eating. Sweep all floors that may contain food sources and have a potential to become dirty. 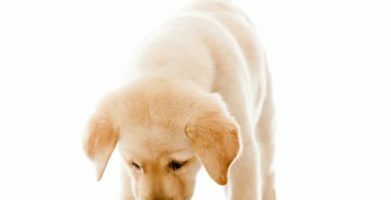 Vacuum carpets to free the area of pet hair and other animal fibers that attract beetles. Replace old and decaying wood trimmings or flooring that some beetles feed from. Clean, move, or dispose of plants that are beetle infested. Seal holes and cracks around doors or windows that will allow access into your home. Inspect plants, carpets, and other materials before bringing them into your house. Keep beetles out of your home, naturally. EarthKind®’s beetle repellent, Stay Away® Beetles, delivers a long lasting, slow release of rosemary essential oils to repel beetles from the treated area. In contrast to pursuing the quick fix of killing pests, Stay Away Beetles provides a lasting and reliable remedy while keeping your house and family safe from harmful chemicals. The beetle's diet—what do beetles eat? string(51) "What Do Beetles Eat Around Your Home & Outside?"